I realized the other day how much time, energy and money I’ve saved thanks to online, iPad and phone apps. I have more apps than I need, but some seem especially useful for radio work. So, from one radio guy to you — here are five apps that you may never have heard of that just may change your life or at least make you more productive and effective. This is radio’s DVR. And it’s FREE! 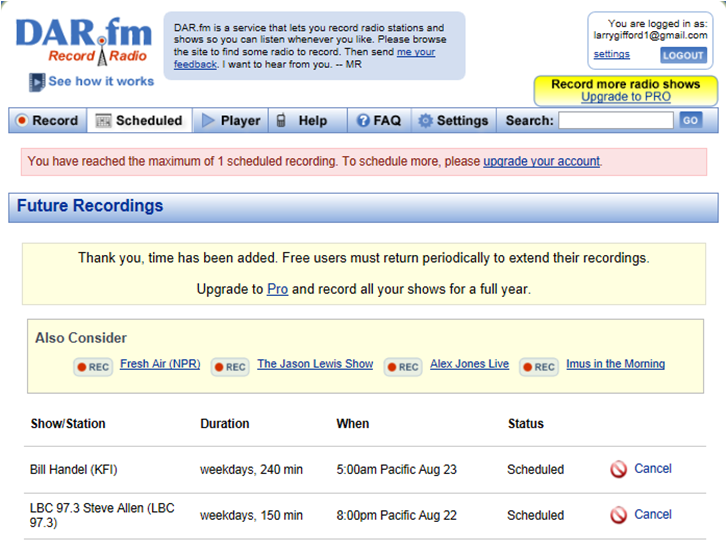 I use DAR.FM almost everyday. 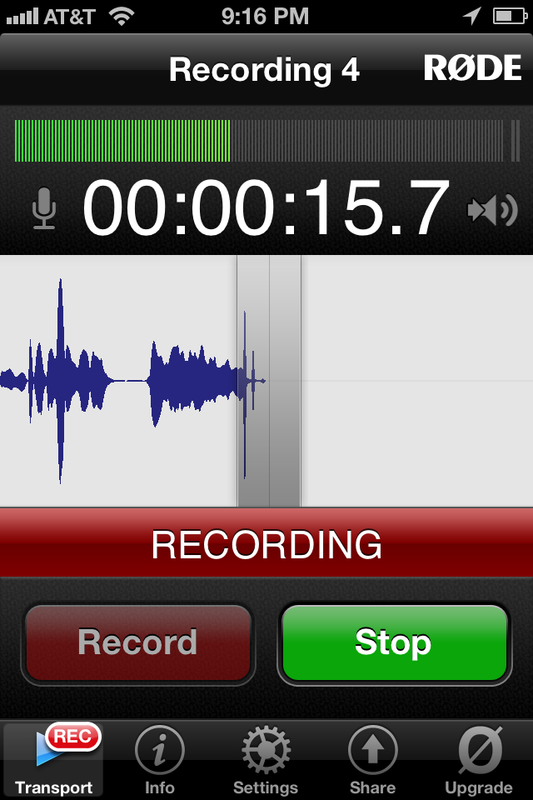 This is a digital audio recorder for radio. The geniuses here have figured out how to assemble nearly every radio stream you can imagine and gives you the ability to record what you want, when you want. They deliver it to you in nice 15 minute chunks, which are transferable to iTunes if you wish. You’ll see in the image I’m set to record Bill Handel on KFI and Steve Allen on LBC 97.3 (London’s Biggest Conversation). Anytime there’s big breaking news somewhere I start rolling on a radio. Anytime I’m consulting a talent or station, this is how I can record the station and listen to it on my time. This is a great $19.99 app that replaces the 360 system’s “Instant Replay” machine which retails for as much as $3,000. Seriously, this is great. It syncs with iTunes and is easy to use. It’s what Deb Slater and I use each week with the Radio Stuff podcast. 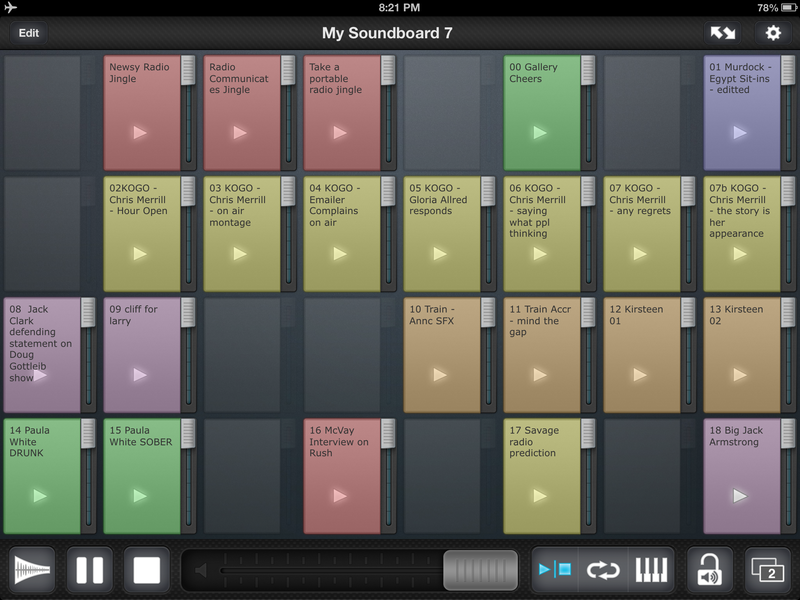 You can change levels, pause and re-start, organize your audio in the order you want it or color code it. Seriously, why haven’t you started to use this yet? RODE REC LE (iPhone, iPad App) A free app with an option to upgrade. Since it is right on your phone – and free – there’s no excuse to never be able to report from a breaking news situation, interview someone interesting, or send notes to yourself. This was the app that Deb used in Amsterdam to conduct her interview with the English Breakfast Radio show. (Listen FF to 34:00). Seriously, it’s free. Just download it in case you need it. Soon you’ll be using it because you have it. It’s the 2013 version of a reporting carrying a pen and a pad of paper. You can’t afford not to have something like this handy at all times. 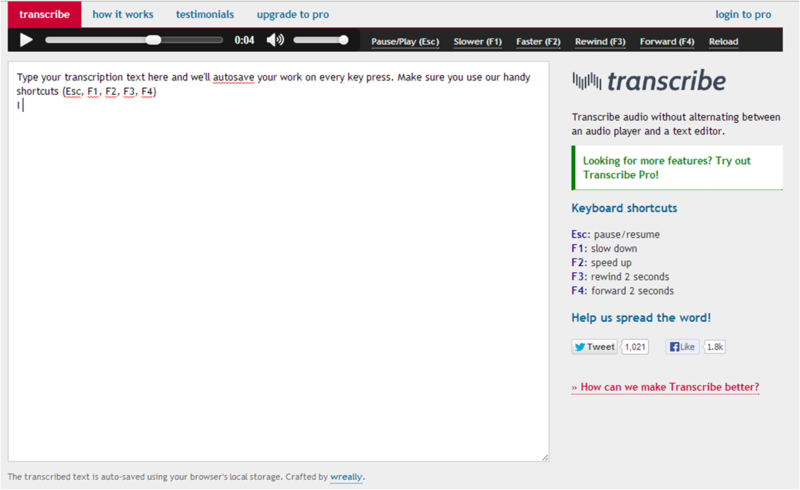 TRANSCRIBE (Google Chrome App) A free app via Google Chrome with an optional upgrade. If you are someone who transcribes audio — and if you’re in radio that’s happening more and more as you need to file stories on-air and on-line, then this is a helpful tool. You identify the .mp3 you want to transcribe, you play it and being typing all on the same screen. You can slow down, speed up, pause: all the things you want to do while transcribing audio. I use it for air checks. I like to use actual words and phrases as examples of what really worked in the segment. I don’t want to use only my impressions of what I heard, but what was actually said that made the impact. This tool helps with that. I also use the transcript to create Word Pictures (see next app). 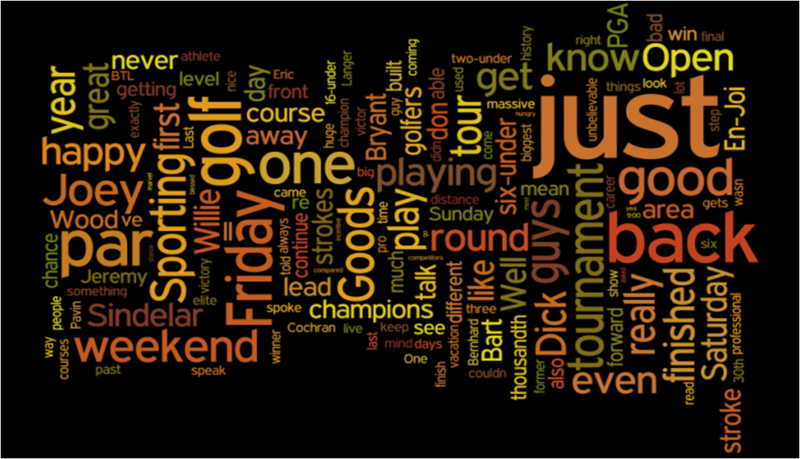 WORDLE.NET (Website) Free and customizable. This is a handy tool to make word pictures. I take the transcripts of air checks and put it through Wordle.net and SEE what the segment I just heard actually LOOKS like. The bigger the word, the more often the host said it. It can catch filler words and phrases, which is nice. It can also reflect for the host what the listener is hearing most versus the message he/she is trying to send. Here are two examples of segments I recently reviewed. Just by looking at the biggest words you should instantly get a sense of what the focus of the segment is. One of these works, the other doesn’t and it was apparent in the audio too. You can see in the first example the hosts use “just” as a crutch word and it’s fairly unclear what the focus of the segment is. 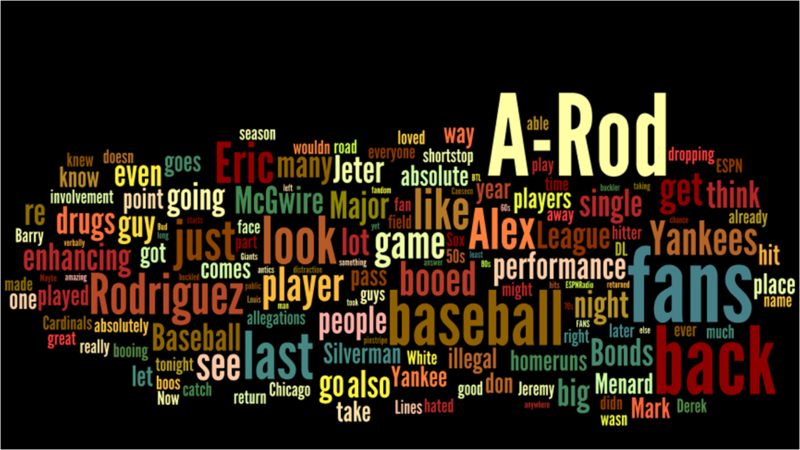 In the second example, there’s not doubt these guys are talking about A-Rod being “back” and what the “fans” think about it. The application allows you to customize color palette, word direction and eliminate words that you don’t want to register. It’s pretty cool. You can also enter a URL or blog RSS feed to create a word picture. WHAT ELSE? What online, iPad, or phone apps are you using that you can’t live without? Add them to the comments section. Definitely could not live without Soundcloud for recording, sharing and hosting audio. And consuming other radio content too. Integrates really well with social media and its simple for our community to leave specific comments on sections of an interview or podcast. I can’t do without a good camera app – people want to see what is happening, what you are seeing or experiencing. Camera+ is my go to for tricky lighting situations (like studios) and precision mobile photos. Finally Evernote and Dropbox for managing ideas, planning, taking notes, collecting info, storing background notes to read later, bookmarking etc. Indispensable. Ryan, great addition. I use Dropbox so often and it is so integrated into my routine, I don’t even think about it as an app. Soundcloud is great as well. I have Evernote, but haven’t gotten comfortable with it yet. Looking forward to checking out camera+. Thanks.